It has been 5 weeks since John and I picked up Panzer from his foster, Louise Kuttler in Hawthorne. We wanted to give you an update on our little boy, Panzer. He is a handful, that we cannot deny, but he also has many redeeming qualities.For example he walks well on the leash and does not pull, unless he sees a rabbit, but even then, he will stop pulling on command, "leave it' and will sit down. We have worked with him on issues that we had been made of, and it is safe to say, that he is doing very well. Within the first week, he was calm and friendly to everyone we met on our walks. 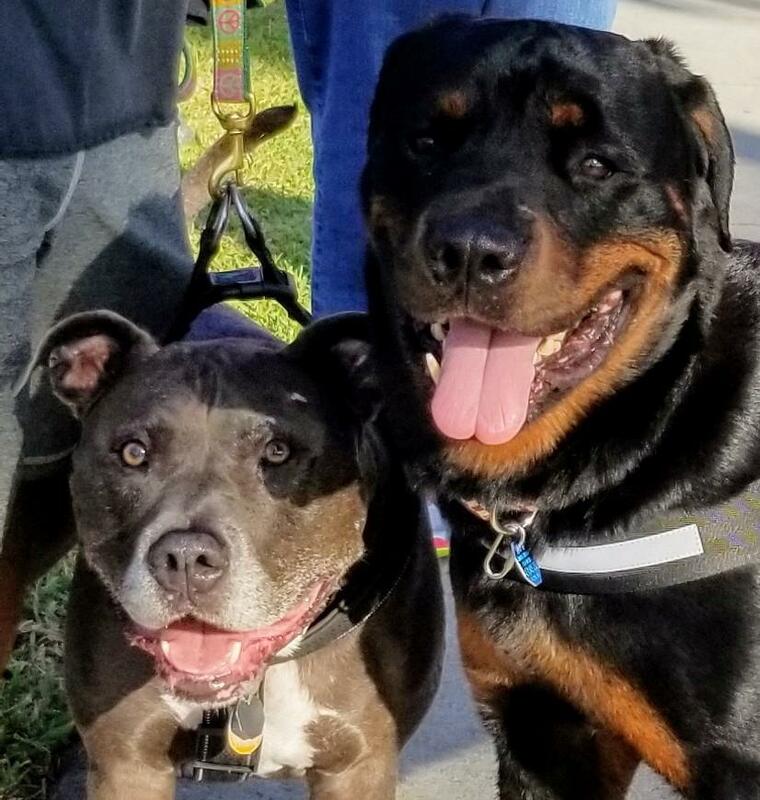 He has made friends,with our neighbor's American Bull dog Rambo, and a Pit Bull, Nike, who is also walked along Indian River Drive every morning. He gets two long walks daily, which by the way are longer than normal because he is so friendly that people will stop to pet him and remark on how good and handsome he is ( we brush him every day and his coat is so shiny and healthy). Of course he loves the attention, he has access to our backyard, and has full run of the house. We have crated him successfully at night, and he now goes in on his own when he sees that we are ready to go to bed. We allow him to get his last 'pee' for the night and then he is good until the next morning. He has had no accidents in the house, has many toys, and does not chew nor is he destructive. True, he still eats as if he was deprived of food at some point in his life, but we have gotten him to eat slower and he is not food aggressive. We can actually move his bowl or food at any time while he is either eating or preparing to eat. He is beginning to realize that there is always food for him here, we do not give him table food, and he does not beg while we eat. He eats grain-free (Fromm's family) dog food, and he is thriving. When we first brought him home, we had him weighed, he was 80 lbs. 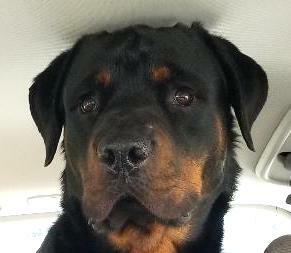 At his vet visit on Feb 1, he weighed 89.6 lbs. We've taken him everywhere, he is a very good traveler and loves the SUV. 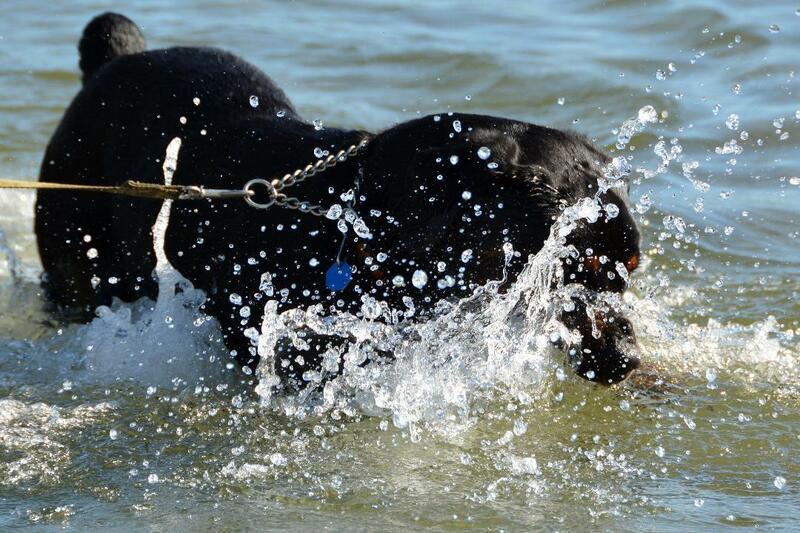 In the past two weeks we started to take Panzer to the cove at the Sebastian Inlet, and while uncertain the first time he went into the water, he truly enjoys going in now. He has blossomed and is a very good dog. Our only issue now, and it's not an insurmountable one, is that he does not want to be left alone. We are now getting him used to staying in the crate for small amounts of time, we started at 10 minutes and we have increased it to 40 minutes.We are both retired, and Panzer is never left alone, but eventually we would like to let him free in the home, should we decide to go out to dinner or have errands to run, where we cannot take him. I believe that he will understand that he will not be crated for long periods of time, as he was in the past. We are not yet ready to leave him loose in the house alone because he has been 'caught' surveying the kitchen counters. He has been scolded and he is beginning to understand that it is unacceptable behavior. We are taking these steps very slowly. We are keeping Panzer, we never doubted it, and he is definitely in his forever home. I think he loves us too. How to start this story? Grace was contacted by a volunteer for the Bull Mastiff Rescue, Jen Young. 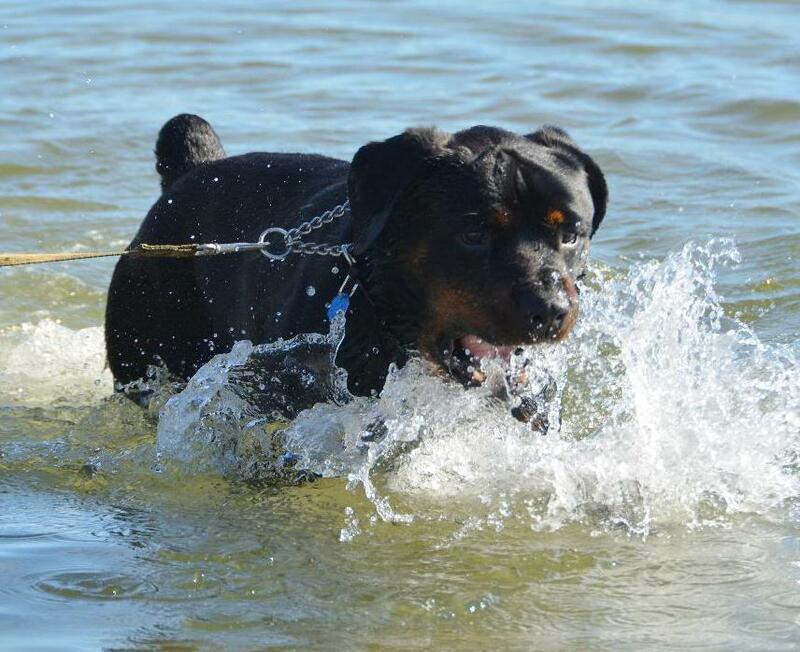 The rescue had been contacted about a Rottie boy who needed rescue and had a hard life. They named him Panzer. Panzer spent most of his time alone and in a crate by his first owners. They gave him away to another couple but living in a condo, he had to be crated while they went to work and he barked , and barked, and the neighbors complained. 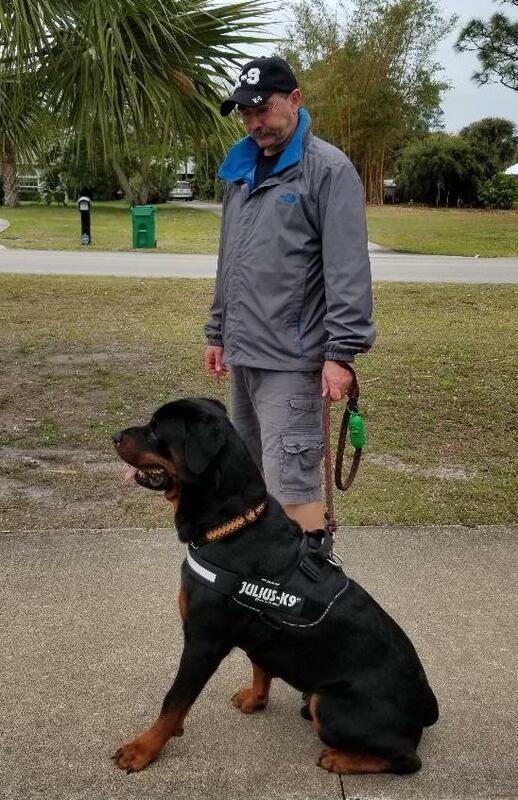 They contacted the Bull Mastiff Rescue who agreed to take him and get him into a better environment, and work on getting him to a Rottie rescue. That is where GGARR comes in. 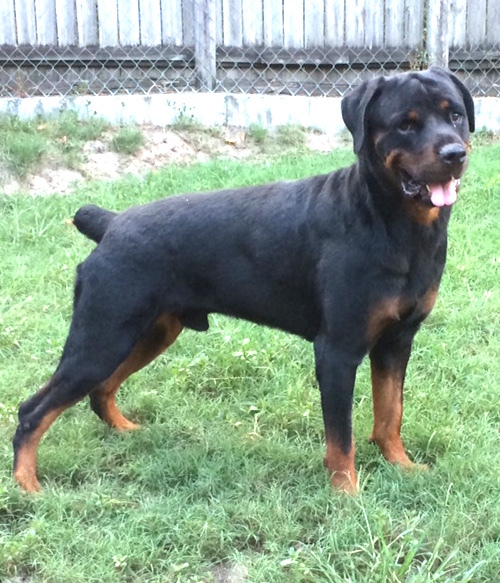 Jen contacted Grace about this 3 yr old Rottie and said yes, we will take him. Panzer is an amazing boy. When he first came to me, he was a complete wild child. Now he is half a wild Child. Panzer had been allowed to do what he had wanted to do with very little structure wherever he came from. He does know to sit and wait for his food but I don’t enforce it every day. He is food possessive as I think he was not always fed enough wherever he was living. He is not fond of small dogs but he currently has a brother/sister next to him and he does not bother them except if they try to get too close to his food bowl while he is eating. He loves attention and loves to be petted. Panzer LOVES to eat. He had no problem eating apples, bananas, cauliflower, zucchini and of course anything meat. He loves pumpkin pie but will spit Broccoli back at you. Which after all he scuffs down, I find amusing. 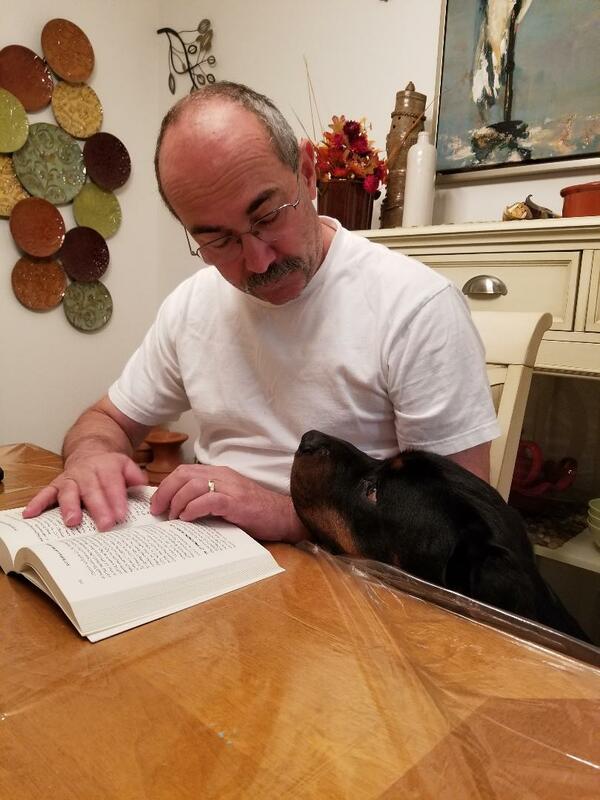 Panzer is a smart dog and with time, love and patience learns things very quickly. He is like a diamond in the ruff. We only do meet/greets with approved adopters so please go to our website at ggarr.org and click on adoption information. That will bring down the application to fill out and submit. It does not commit you to adopting from us, but allows you to meet any in our organization you might want to and hopefully adopt. Great young dog, but does not like cats.